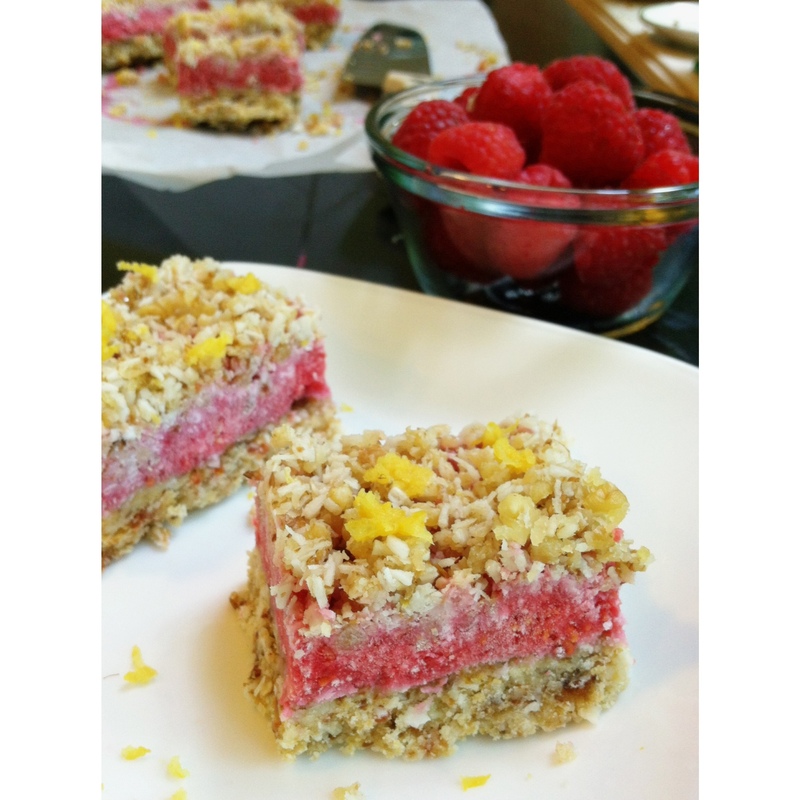 Raw Raspberry Crumble Bars. | Eat More Plants. I made the mistake of making these at night, not realizing I had to let them sit for two hours in the freezer before chowing down. I am not a patient person when it comes to desserts. I tasted each layer of these bars while I was making them and altogether I knew it was going to be out of this world. Like spaceship to the moon out of this world. As usual, I was right. Bonus: these are super fast to make if you don’t count the two hour wait to eat them. Literally took me about 15 minutes to put these beauties together. It does not get much easier, yummier and healthier than this. 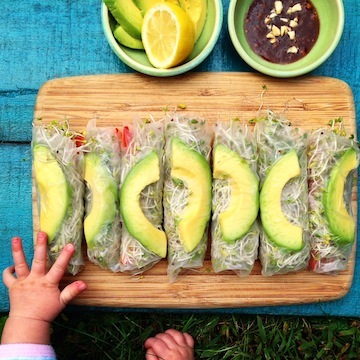 I got this recipe from the ever so lovely Almonds & Avocados blog. Wonderful, healthy recipes. Blend all ingredients together in a food processor until finely ground and when you squeeze it in your hand it sticks together. Press firmly and evenly into the bottom of a parchment lined loaf pan. Place in the freezer until the filling is ready. Blend all ingredients in a blender until smooth. Adjust sweetener if necessary, I only needed 2 T of agave to achieve a nice flavor. Pour over your cold crust and spread out to make an even layer. Return your pan to the freezer until the top is ready. Put all ingredients in your processor. Pulse 10 times until you achieve a crumbly texture. You don’t want this as finely ground as the crust. Pulse just until everything is combined. Remove your pan from the freezer and sprinkle the topping over the raspberry filling. Gently press the topping down. You don’t want it to go into the raspberry layer completely, you just want it to adhere. Return your pan to the freezer and cover with plastic wrap. Leave for two hours. Remove from the pan by pulling the parchment out slowly at the edges. Cut into squares and let sit for 15-25 minutes to defrost before eating. Hot Chocolate & Messy Kitchens. Sounds out of this world! Thank you for sharing 🙂 making these for sure!